Un paiement immédiat de 4,39 $US est requis. Returns Not Accepted These are steel phonograph needles. Once a package is opened I cannot resell them, So returns are not accepted. You either need these or you don't It's not up to me to make sure you are buying the correct item. 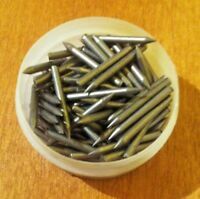 If you don't tell me when you purchase what type of needles you'd like I will ship Loud tone by default unless I am running low on Loud. I have a weekly record spinning gig with a 1930 HMV Tabletop Orthophonic wind up, in a 1930's Art Deco Bar and these needles work great! I only need Loud needles if the place is really, really, crowded, Medium if the place is merely crowded, and the Soft ones work most of the time. So if you happen to be in San Francisco on a Sunday night, come by Stookey's Club Moderne at the corner of Bush and Taylor St. for period music (mostly Jazz) and fantastic fancy 1930's post Prohibition Cocktails! My records sound great with these needles, even on an off-brand, ca. 1940 portable. Out of a small, off-brand wind up portable from around 1940, which has had no work done on it, comes a clear, big sound, even with soft tone needles. This is a terrific value, and great to know that my records are safe. 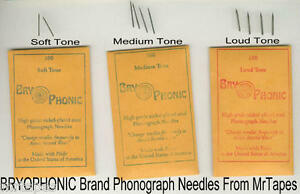 These Bry-O-Phonic needles are quite high quality. They are sufficiently soft so as not to damage records (I use for a single play only), and they are attractively nickel-plated, which I imagine probably helps prevent oxidation. The gauge of soft tone needle seems just a bit heavier than some others which allows you to get a kind of "soft-medium-soft" volume level just a bit louder than the super-soft tone needles. I like all of the volume levels quite a lot.